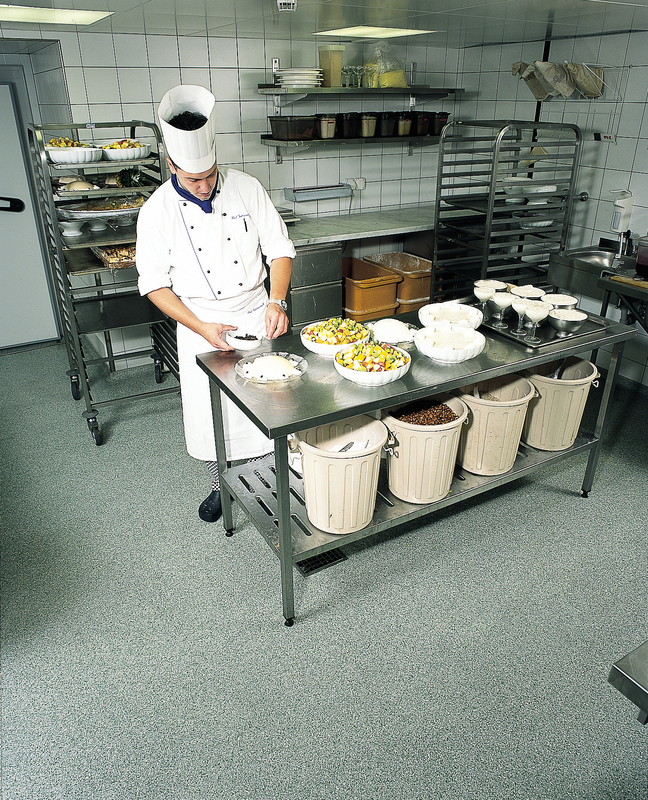 Silikal food prep area flooring can be found in thousands of restaurants the world over. 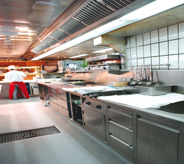 Floors in a food prep area must essentially be non-slip so that they prevent spills and accidents. 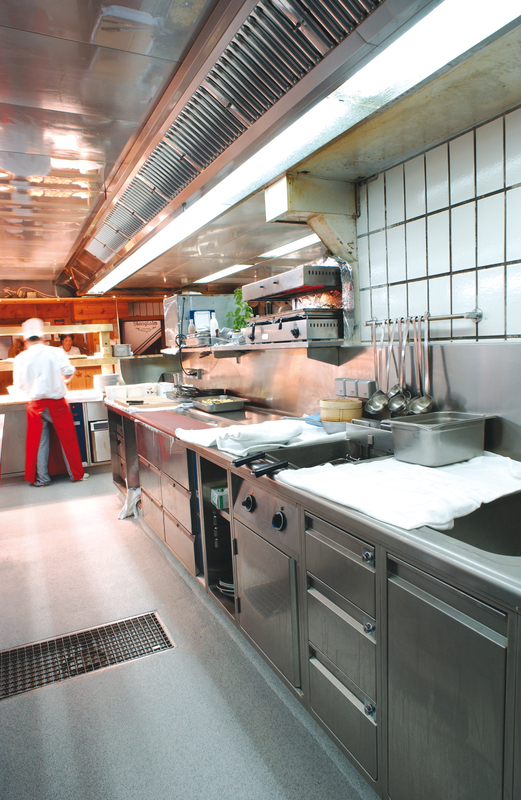 All flooring in a food prep area of a restaurant must be easy to keep clean in order to prevent mold and bacteria from forming there. If you are one of the eager watchers of all of those “chefs versus chefs” shows, you are only too aware of what a food prep area is like. Actually much of the food prep area is oftentimes messy as you’ve undoubtedly seen. Food particles seem to fly away onto the floor. But of course what happens to those food particles depends on the food prep area flooring. For example, it is common for such areas to be covered in some kind of rubber flooring. 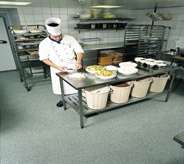 Rubber flooring has a tremendous amount of negatives going for it as food prep area flooring. For instance, rubber flooring will actually deform when heavy loads are placed upon it. The deformity causes many of the weld seams to actually split apart, and thus can cause tripping and falling of the kitchen help. What happens next is that the rubber will ultimately lose its grip on the subflooring, and thus it will become increasingly more slippery. Unfortunately this also makes it increasingly capable of causing trip and fall accidents. What happens next to this rubber flooring is not appealing in the least. Now, utilizing those split seams, grease and spilled liquids, as well as the afore-mentioned food particles make their way under the flooring. What happens subsequently is that mold, fungus, and bacteria have found a welcoming home, and often foul odors will rise from such flooring. Those who have tried actual tile for their food prep area flooring have unfortunately found out that eventually the grout holding those tiles in place will allow dirty water to enter under the tiles. Once that dirty water enters under the tiles, once again that mold, fungus, bacteria have found yet another welcome home, and often foul odors will rise from such flooring as well. Eventually tile then begins to pop up with increasing frequency once more causing a very severe capability of causing trips and falls. Various concrete coatings are also rubberized. Unfortunately using one of those for food prep area flooring is a very poor idea. What happens is that it rapidly wears down which will then leave the concrete below completely unprotected. Unfortunately “unprotected “means that once more the concrete will be plainly condemned by all kinds of bacteria and mold, all unquestionably not what any restaurant in a commercial food prep area needs. This in turn draws bugs and rodents, and eventually the restaurant will receive heavy fines and perhaps even be forced to shut down! 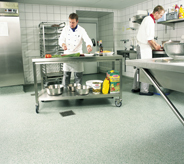 The best solution for food prep area flooring is Silikal. First, Silikal is completely and always will be monolithic. Unlike other flooring, it will never develop pin holes, air bubbles, cracks or any kind or breakdown. A very good reason for this is the fact that Silikal utilizes enhanced MMA (Methyl Methacrylate) but take good note of the word enhanced. Silikal has patented its enhancement because it makes its product totally different than those who use “regular” MMA. The difference is seen once the flooring has been down a while. What happens is that it looks as if it had been installed just yesterday, year after year. That’s why it’s referred to as lifetime flooring.